Hey everyone! Hope you all had a great week. Mine went by so quickly - I can't believe it's already Friday! 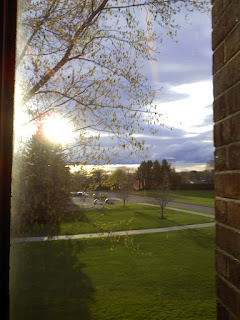 This week was the last full week of classes, so everyone is getting ready for finals, which start next Friday. So crazy to think that my first year of college is almost over! It totally made my day and reminded me to appreciate how beautiful Vermont is! On Wednesday I had Lit Choir, which is always a great time. Also on Wednesday, my friends and I spent most of the day decorating our shirts for P-Day, which is this upcoming weekend. P-Day stands for Preparation Day, which basically means it's a day for everyone to take a break from studying and relax before one of the craziest weeks of the semester. My friends and I all love The Hunger Games, we decided to make that the theme for our shirts. I will post a picture once they're all done soon! But just so you get the idea, we decided to dye our shirts camo colors and write District 12 on the back, because obviously District 12 is the best, and it's 2012! We're pretty happy with how our shirts are turning out. One more thing about Wednesday! My friend Vick unfortunately lost her phone, so she was a bit worried about that. However, on Wednesday night we figured out where it was, so on Thursday we went to pick it up. Someone had found her phone on the library lawn and picked it up and kept it safe. Eventually we got everything straightened out and Vick got her phone back! She was so relieved and happy that someone found her phone and immediately notified her they had it. Just shows how nice the people at Saint Mike's are! Thursday night means Zumba night for my roommate Emma and me! We had a great time, and afterwards Emma decided she wanted to stop by Alliot to fill up her water bottle. Once we got there, we both looked at each other questioningly because we had seen the waffle makers out and were thinking about having one. We ended up splitting one and it was absolutely delicious! 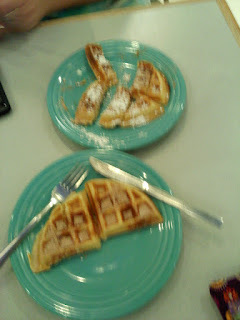 As you can see, we put cinnamon sugar as well as powdered sugar on our waffles to make them taste even better. In addition, I got some honey and dipped my waffle in it to see how it would taste because I used to always have honey in my waffles. It was just as good as I remembered it and I was so happy! I would've taken a picture of Emma and I to capture our happiness, but we were all sweaty and gross from working hard at Zumba, so we decided my readers could do with just a picture of our yummy food :) Anyway, I would have to say last night was the best roomie date ever! Today I don't actually have class because philosophy, which is my only class on Fridays, was cancelled since my professor is away at a conference. I started the morning by having a relaxing breakfast in Alliot and then came back to my room and caught up on the latest episode of Private Practice with Emma. Now I'm off to get some work done before my crazy weekend, which I'll be sure to blog about ASAP! Hope everyone has a fantastic weekend, and thanks for reading, as always!